A smart watch made especially for kids called the Alcatel Move Time Track & Talk watch is listed and available on Flipkart with a price tag of Rs. 4,799. Key highlight about the Alcatel Kids watch phone is that it can track the user location and also comes with call functionality. Alcatel Move Time smartwatch sports a 0.95 inch color OLED screen supporting 96 x 64 pixels resolution. This Bluetooth smart watch is compatible with Android and iOS platforms. Watch weight is 40 grams. You do need an active SIM card with data enabled. There is SIM slot, just insert the SIM and the watch is ready to use. By default the smart watch will show the time, date, signal bar and battery level. This is tracking device you can use this to track your kids location using GPS locator. In case of emergency your kids will be able to make calls to any of the pre-registered numbers or reply to 10 preset contacts. Apart from this parents can make calls and also send voice messages when their kids leave a preset safe zone. Other features are Bluetooth 4.0, Built in GPS, WiFi, Call function and 2G. This smart watch is also water and dust resistant (IP65 certified). There is 380 mAh battery that takes about 1 hours to charge and gives standby time of up to 96 hours. Alcatel Kids Watch Phone with location tracking is available on Flipkart for Rs. 4,799. To download the app, visithttps://www.whatsapp.com/download from your desktop browser. Then, open the app and scan the QR code using the WhatsApp app on your phone (look for WhatsApp Web menu under Settings). Linux geeks rejoice. 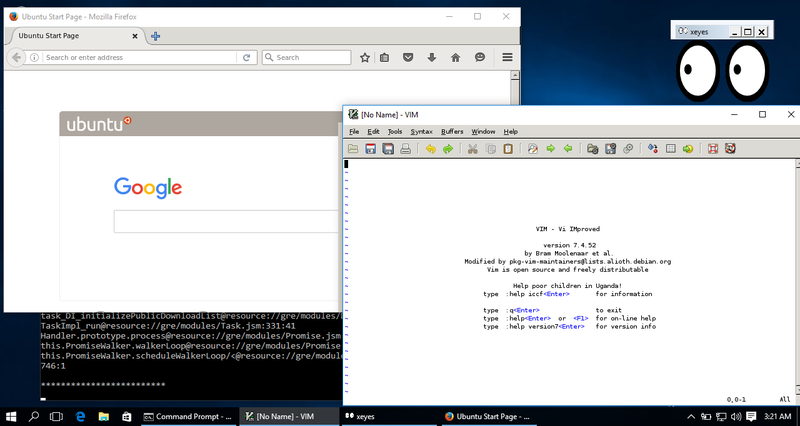 As of build number 14328, Windows 10 allows you to run a special flavor of the Bash shell (on Ubuntu) in a window. Using Bash, you can navigate around the file system, install and run Linux command line apps like the vi text editor or, with some unofficial tweaks, try to load windowed programs. 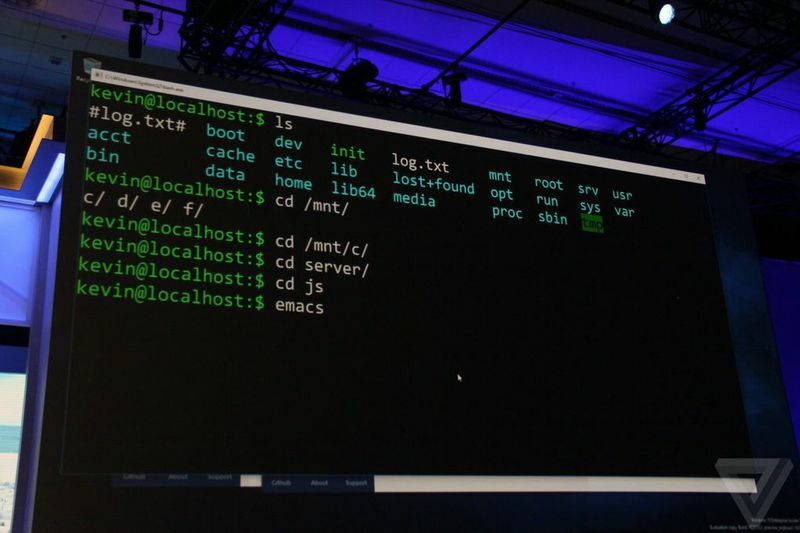 However, before you can use Bash in Windows 10, you have to turn it on. Here's how. 1. Navigate to Settings. You can get there by clicking the gear icon on the Start menu. 2. Click Update & security. 3. Select For Developers in the left column. 4. Select Developer Mode under "Use developer features" if it's not already enabled. 5. Navigate to the Control Panel (the old Windows control panel). You can get there by hitting Windows Key + X and selecting Control panel from the pop-up menu that appears. 6. Select Programs and Features. If it's not visible, make sure you select "Large icons" from the "View by" menu. 7. Click "Turn Windows features on or off." 8. Toggle "Windows Subsystem for Linux" to on and click Ok.
9. Click the Restart Now button. 10. Search for Bash in the Cortana / Search box and click its icon. 11. Type "y" and hit Enter when promoted to install Ubuntu. The system will then take a few minutes to install Ubuntu in the command prompt window. 12. Create a username and password. You can now use the Bash shell as if you were on a a computer with Ubuntu installed as its primary OS. There are a few command line apps built-in, including the vi and pico text editors, and you can add more by using the apt-get command. There's also a program which allows you to run windowed Ubuntu apps in Windows 10. Installations from a USB flash drive have become one of the easiest ways to update your computer with a new operating system. A USB installation is quick, extremely portable, and has the added bonus of reverting back to a storage device following the install. I cannot tell you how many discs I ruined over the years by messing up the write process, but I have a lot of very shiny drink-coasters in my living room. You’ll find a fair few ISO to USB tools out there, and they feature a range of tools for beginners and advanced users. To keep this test fair, I’m going to use each tool to burn a copy of Windows 10 Insider Preview 10130 x64 to an 8GB Integral drive, formatted each time. Let’s take a look at the burn time, and the resources available to each software. For science! By the way, we’ve previously covered how to legally download Windows ISO files. Before we plough into the testing phase there are a handful of acronyms I’d like to spell out, and a few other bits of ISO to USB jargon we’ll clear up. Bootloader Options: the bootloader loads the operating system. Some ISO burners allow you to choose the Bootloader you’ll need for your desired operating system installation. grub4dos: a bootloader package designed to allow users to select between multiple operating systems installed on a single system. syslinux: a lightweight bootloader package designed to allow users to select between multiple Linux or Unix installations. QEMU Emulator: short for Quick Emulator, is a hardware virtualization tool. In this context, it allows users to test their USB before proceeding with the burn process. Cluster Size: defines the smallest available space for storing data. Instead of assigning individual disk sectors, the file system assigns contiguous groups of sectors, called clusters. File System: controls how data is accessed and stored. Without it, your data would lump together with no beginning or end. A file system offers definition for easy access. There are different file systems available, though your burning tool should be discern your requirements via the ISO you use. Bad Sector: Some ISO to USB tools allow you to perform a bad sector check. Before the burn commences, your USB will be scanned, fixing any irregularities to ensure your installation is smooth. Somewhat similar to defragmenting your desktop, but on a much smaller scale. First up, Rufus. Rufus comes as a very small executable with minimal options for tinkering, aside from partition scheme, file systems, cluster size, and the type of bootable you’ll be creating. Once you’ve selected the bootable disk type and theISO image you’ll be burning, you can happily hit Start and wait for the process to finish. Rufus clocked in with a 16m55s according to my phone, but also has its own timer, which showed 17.02, though the built in timer did fluctuate throughout the process. At one point, it was over 10s behind my phone, but closed the gap to a mere 7s at the finishing line. Obviously, I am right, but it is still a good time. Such an eloquent name. You select your ISO. You select your media type; USB or DVD. You click Begin Copying, and off it goes. In what is the most basic of basic GUIs, and with only two options, the Windows 7 USB/DVD Download Tool is almost sublimely simple, comparable only to ISO to USB. Timing-wise, it clocked in with 16m53s, leaving it sitting pretty. A definite winner for those wanting a serious no-frills burning tool. RMPrepUSB is one of the most complete ISO to USB packages on this list. Aside from the above mentioned features, it comes packed with a host of other BootLoaders, DiskDoctor, Speed Tests, and individual user configurations for those drives you constantly prepare. With a time of 22m36s RMPrepUSB isn’t the fastest of the bunch, but certainly makes up for it in customization. Bonus points for the centralized tooltip, constantly updating as you scroll over menu items. WinSetupFromUSB offers a mid-range of features. It isn’t quite RMPrePUSB, but it has so much more to offer than the other basic burners we have already covered, particularly the inclusion of FBinst Tool, Bootice, and RMPrepUSB. Each of these additional tools come with popup instructions detailing their use alongside WinSetupFromUSB, but can all be used with their original functions i.e. RMPrepUSB opens in its own dialogue with the customizable ISO/USB interface mentioned above. As for speed, 23m29s represents one of the slower tools on the list, but is included due to the wealth of customization available to users. You can use the UltraISO trial version an ISO to USB tool. Whilst the trial version restricts the size of ISOs created, it does nothing of the sort if you’re burning something created elsewhere. On opening UltraISO, browse to your ISO location in the bottom half of the file explorer. Once located, double click. This loads the ISO image for burning. Then head to Bootable > Write Disk Image. Be sure to use the USB-HDD+ option for best results, unless advised otherwise. Hit Write and off you go! UltraISO clocked in with a 20m24s, sitting nicely in the middle of the pack, and made the cut against the very similarly timed WiNToBootic through its additional features such as image mounting and ISO creation. YUMI, or Your Universal Multiboot Installer, is another multiboot installer with settings for a massive range of ISOs. Unlike Xboot, YUMI asks if you’d like to add another ISO or Distro to your USB following a successful burn, so don’t worry if you cannot find the multiboot builder. It clocked in with a stupendously fast 14m50s and takes the crown by just over two minutes, plus it has the best name on the list, so obviously another massive point for that. YUMI! If we are talking time, plus the bonus of being able to create a multiboot USB packed with everything you might ever need. However, let’s not discount those more advanced ISO to USB tools, RMPrepUSB and WinSetupFromUSB. While their speed performance couldn’t match YUMI, the massive range of tools and customizable settings more than make up for it. Finally, I’ve been using the ISO to USB tool for its ridiculously simple interface and fairly reasonable burn time, but even that has been bested by Rufus, so now I don’t know what to do, other than switch to something faster. XBoot is another multiboot tool featuring an inbuilt downloader, but timed in over 24 minutes. YUMI blew it away! WiNToBootic fits into the basic features category, alongside the Windows 7 USB/DVD Tool and Rufus, but clocked a slower 20m14s. Passcape ISO Burner is a multifunction burning tool, but it wouldn’t work for me. I have read other positive reviews, so it could be worth a look for other individuals. ISO to USB is another very basic burner, and one I’ve used extensively. However, it didn’t make the cut through a slow time and lack of features. Hopefully you’ll have a clearer picture of the USB to ISO offerings available to you as more and more of us switch to a world without optical disk drives. Google remembered Safer Internet Day, though. To celebrate, it has brought back the free data reward for completing a security audit of your account. A few minutes of your time gets you an extra 2GB of Drive storage for free. The security checkup is painless and only takes a few minutes. You'll review your account recovery options, connected devices, services with permissions on your account, and 2-step verification settings. The 2GB of storage might not show up in your account immediately, but when it does, it will be there permanently. 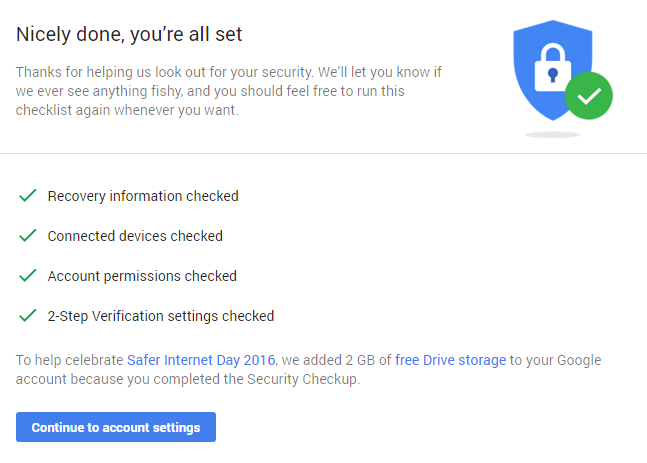 Google did the same thing last year for Safer Internet Day, and it sure would be nice if they kept at it. We don't yet know when this offer will expire, but last year you had a week to complete the checkup. There might be a Google blog post at some point with details.